If you thought that termites are simply termites, think again. There are more than 2000 different species in all. There is the desert termite, conehead termite, subterranean termite, formosan termite, drywood termite, dampwood termite, and more. Regardless, every single one of them is referred to as the “silent destroyer”. Even though no immediate signs of damage may be apparent, they are likely thriving and hiding in your yard and home, just waiting for the perfect opportunity. Termites have a colony of sorts composed of pale colored and soft bodied workers, and larger kings and queens. There are also reproductive ones or flying termites. Ideally, they eat trees and dead plants but will feed on any cellulose food. And as good of an idea as all of the above-stated deterrents and precautions are, the only way to get rid of termites once they have sunk their teeth into your homes is to call a professional pest control company. Can a termite chew through concrete? No. Unfortunately, all they need to get into your house is an opening or crack that is 1/32”. Across. Wherever concrete is broken, plumbing comes into a home, or two pieces of poured concrete separate, there is ample room for termites to enter. 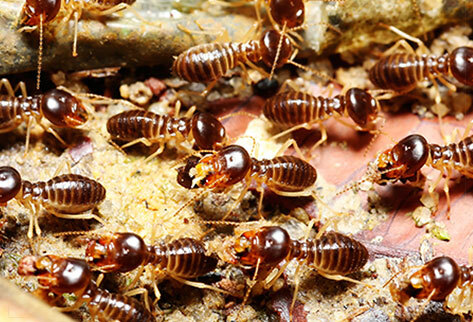 If termites are subterranean swarmers, will they infest my closets, furniture, and more? Colonies of terminates that are subterranean swarmers usually are in search of soil that is moist and near wood. They have the best chance of survival out of doors, so it is not likely that you will find them in your home. What is the life expectancy of a termite? This is actually a two-part answer: Queens can go on and on for decades, whereas a maximum of two years can be expected from the workers. Need Help with Termite Control Today? Termites are not something you want to mess around with. If there is even the slightest hint that a termite problem may be taking over your home or business premises, calling PEST is the best solution that can stop the damage from becoming severe or irreversible. Don’t spend money unnecessarily on repairs and replacements when just allowing the highly skilled and experienced technicians at PEST to work is such an easy solution. Get in touch with us today to eliminate termites effectively. Call us at 212.945.0868 or email us at info@pesteliminationsystems.com to get started.